All home cooks should have steaming in their arsenal of cooking methods. It's particularly useful for preparing many types of vegetables. Not only is it a simple and quick way to cook them, it also preserves their nutritional value better than the more commonly used method of boiling, which causes antioxidants and other nutrients to seep out into the water. 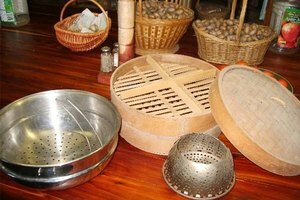 A steaming basket is the traditional kitchen tool for steaming food, and it's a handy gadget to have around. But if you don't have one, that doesn't mean this cooking method is off the table for you; steaming veggies without a steamer is certainly possible. Most vegetables respond well to steaming. Broccoli, cauliflower, peas, green beans, asparagus, carrots and other root vegetables, Brussels sprouts, artichokes, zucchini and tubers are all commonly steamed. And many people don't realize that steaming is a good option for preparing leafy greens like spinach, kale, cabbage and collard greens. Cooking times typically range from about three to 20 minutes when steaming. The harder or denser the vegetable, the longer it takes, which is true of any cooking method. So, if you're steaming carrots without a steamer, it takes considerably longer than steaming spinach, one of the fastest-cooking veggies. Peel vegetables that require peeling and thoroughly wash your veggies under cold running water before cooking them. Uniform sizing is the key to uniform cooking. 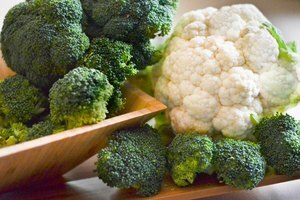 Whether you're steaming broccoli and cauliflower florets, chunks of potato or anything else, cut them into equally sized pieces. If you're slicing something like carrots, beets or turnips, make the slices of equal thickness. The smaller the pieces and the thinner the slices, the faster they cook, but generally speaking, shoot for bite-sized morsels. All you need for steaming veggies without a steamer is a pot, some aluminum foil and a heatproof plate that fits into the pot. Put about one-half to 1 inch of water in the pot, then toss in three balls of aluminum foil that are approximately the size of golf balls – you just need to be able to place the plate on them without the plate touching the water. Bring the water to a boil, then turn the heat down to medium-low. Place the heatproof plate on the foil balls and put the veggies on the plate. If you're steaming different types of vegetables that need varying cooking times, start with the veggies that take the longest. Cover the pot and cook the veggies until they're tender-crisp, or until leafy greens have wilted. Scoop them out and toss them in a little oil or melted butter, if you like, and season to taste. If you're cooking carrots, potatoes or other veggies that take a while, check periodically to make sure there's still water in the pot to make steam. Add a little water as necessary. Peas: about three to four minutes. Asparagus, green beans: about five to seven minutes. Broccoli, cauliflower: about seven to 10 minutes. Kale, Swiss chard, collard greens and other hearty greens: about seven to 10 minutes. Carrots, beets: about eight to 12 minutes. Potatoes, turnip and squash: about 12 to 18 minutes. You can also use the microwave to steam vegetables without a steaming basket. This is even faster, but many veggies don't come out quite as attractive with this method. They'll probably get a little shriveled, so only use the microwave when you don't care about the visual appeal of your veggies – like if they're going into a larger dish where they'll be disguised or when you're eating by yourself in your underwear on the couch. 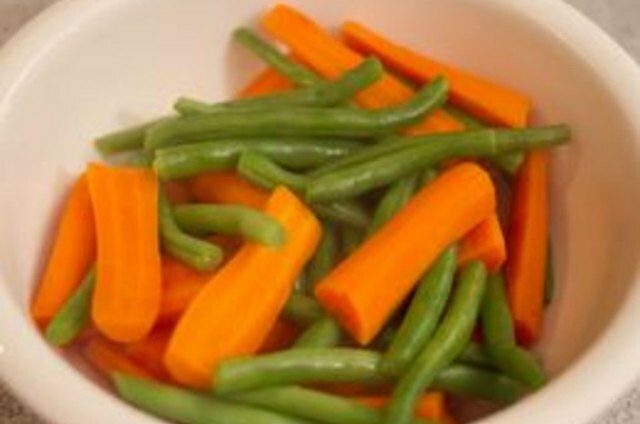 Put the veggies in a microwave-safe bowl and add about 1 to 2 tablespoons of water. Cover the bowl with a microwave-safe lid or wrap. Because the veggies are getting cooked by the microwave in addition to being steamed, cooking times are approximately one-third to one-half of what they are when steaming in a pot.